I was expecting to see a reaction from Manchester United against Valencia, but we did not get one – their performance was simply not good enough. Like manager Jose Mourinho said afterwards, a 0-0 draw in the Champions League was not a disaster in terms of a result, but the display was a huge disappointment. In fact, the quality was so poor it did not even feel like I was watching a United team. For starters, I have never seen so many of their players give the ball away so often, and the supporters had nothing to get them out of their seats because there was so little pace and urgency. The fans deserved better and they started leaving Old Trafford after 75 minutes. To be honest, I don’t blame them. United have got to get back to basics – because they are not even doing the basics well enough. What I mean by that is passing the ball 20 yards with pace on it, or talking to each other and looking like a unit. It sounds ridiculous because we are talking about such expensive players who are earning big money, but that is where they are at the moment. What happens next? Well, I don’t believe sacking Mourinho is the answer because I think he can put things right – but the question is how? It is really difficult to watch United like this and I wish I knew what is going on behind the scenes. There is something fundamentally wrong that we don’t know about because the togetherness they need in their squad is just not there at the moment. Whatever the problem is, I want them to iron it out quickly. United have still got world-class players and a world-class manager – but their performances are a long way off world class. How do you resolve any off-the-pitch issue that is affecting the team? Well, in my era – which is a long time ago now in the early 1990s – we would sort it out ourselves. The players would have our own team meeting where everyone would go to the pub or out for a meal. We would get together in a room and everyone would have their say. Everyone had to talk too, and you had to tell the room what you thought was wrong. If, say, you had a problem with another player then you had to say what it was. If you had an issue with the manager then you had to explain why. When that happened during my time at United, the senior players – the likes of Steve Bruce, Bryan Robson, Gary Pallister, Peter Schmeichel and Paul Ince – would relay back to the coaching staff what the players had said. It was not a case of talking about it behind people’s backs; it was all aired in the open and everyone accepted it because we all wanted the same thing – success. We all wanted it at United, and we wanted to work with each other because we thought we were good enough to get it. I still believe all of that is the case with the current United squad. If you look at their starting line-up on Tuesday, you cannot dispute its quality. What they have to do is find a way of getting back to the level they need to be at. You can tell from the reaction of the fans who booed at the final whistle that they are as frustrated and disappointed as me. They are getting the raw end of the deal at the moment, and they want this to be fixed as well. Everyone who is connected to the club does. I was at Old Trafford for BBC Radio 5 Live and although the crowd was clearly unhappy I did not get a sense they were anti-Jose. I was asked after the game if I still think he is the right fit – and I think he still could be. However, something dramatic has to be said or done for that to happen, because United need to be in harmony and, right now, that is definitely not the case. Defender Chris Smalling came out afterwards and said the dressing room was pulling together, but I did not see any evidence of that against Valencia. Are they playing for the manager? I don’t know, but from the body language I saw on Tuesday I would say no. I saw a lot of arms thrown in the air and players questioning why they did not get the pass or why it was not better, which is very rare to see at Old Trafford. Yes, it is Mourinho who has to drive any improvement. He is the manager and it is down to him to get the players to do exactly what he wants them to do on the pitch. But the United players have got to take responsibility too. At the moment I don’t see enough of them really digging deep and saying, ‘right I am going to take this game by the scruff of the neck, and make something happen’. I have not seen it for a long time, and it is very frustrating. Before the Valencia game, I asked for a positive performance following such a disappointing defeat by West Ham on Saturday. Unfortunately, although I got 20 minutes of positive football at the start of the game when United were playing with energy and intent, that was basically it. After that, some of their players seemed to change positions and Marouane Fellaini got a little bit further forward, with fellow midfielder Paul Pogba dropping back. That is where it started getting disjointed. Nobody got close enough to striker Romelu Lukaku to give him proper support, and Pogba started playing so deep he was picking the ball up from centre-back Eric Bailly – and he cannot hurt people from there. Let’s not take anything away from Valencia. The Spanish side were fantastic, but United cannot afford for all of this to happen again. 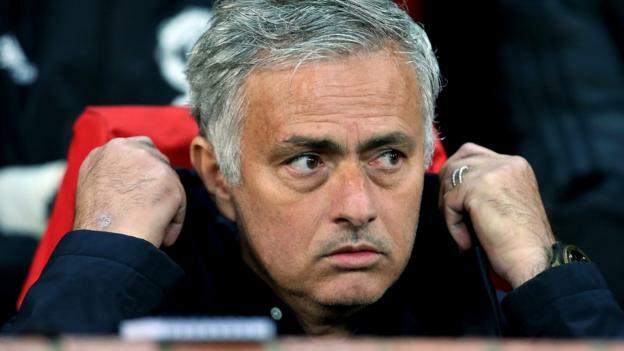 They have some games coming up that could kick-start their season if they win them – but the pressure on Mourinho will increase if they don’t. Newcastle, who come to Old Trafford on Saturday in the Premier League, will think they can have a go at Mourinho’s men. Then United play Chelsea away, which sees Mourinho go back to Stamford Bridge, and then Juve – and Cristiano Ronaldo’s return to Old Trafford in the Champions League. None of those games will be easy and Mourinho has to be careful. I don’t think he is at the stage where he needs to get positive results in those fixtures or he is out – but any more defeats will leave him in a very precarious position. I just hope he gets it right. I think this United team have got so much more to give – and it could still happen for them under Mourinho.